LeBron James had 18 points, six rebounds and eight assists as the Heat won their fourth game in a row. MIAMI — Not every game can be against the Indiana Pacers for Eastern Conference supremacy. Others are needed to fill out the NBA regular-season schedule. 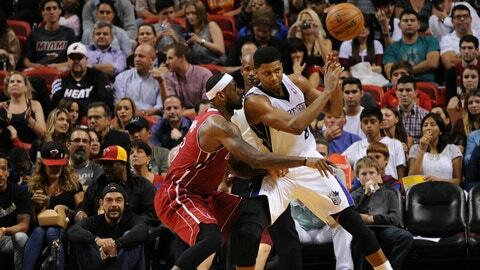 Such was the case Friday night, when the Heat defeated the Sacramento Kings 122-103 at AmericanAirlines Arena. Miami’s point total was its season-high as the Big Three and Ray Allen led the Heat (20-6). Chris Bosh scored 25 points and Dwyane Wade added 20. LeBron James had 18 points, six rebounds and eight assists. Allen came off the bench to score 18 points on 8-of-13 shooting in 25 minutes. It was the 13th straight time Miami scored 100 or more points against Sacramento, which trailed by a point with 8:45 remaining in the third. Two nights removed from a thrilling come-from-behind three-point victory against the Pacers, the Heat faced a Sacramento team that entered 7-17 and in last place in the Pacific Division. But as Wade said before the game, the two-time defending champs are used to getting everybody’s best shot — that was certainly true in the first half when defense rested at both ends. Miami led 67-61 at the half after shooting 61.7 percent (29 of 47). Sacramento shot 66.7 percent (26 of 39). One reason for the high-percentage shooting was the proximity of the shots. The Heat scored 48 points in the paint and 18 off fastbreaks. The Kings recorded 36 in the paint. With 19 points, Bosh had his highest scoring half of the season. How wild were the first 24 minutes? Miami sharpshooter Allen had two dunks, including one after grabbing a rebound and going coast to coast. Things turned in the third quarter, when Miami outscored Sacramento 31-21. Leading 72-71 with 8:45 to go in the period, Miami went on a 21-6 run during the next six minutes. Bosh had 6 points and Shane Battier nailed two 3-pointers during the spurt. Miami’s 21-6 run during a nearly six-minute span in the third quarter opened a 16-point cushion. The Kings failed to get closer than 14 the rest of the way. Bosh had 19 points and 7 rebounds in the first half, then helped fuel the pivotal third-quarter run that put space between the two teams. Miami shot 61.4 percent (51 of 83) overall thanks partly to 70 points in the paint and 22 fastbreak points. The Heat conclude their five-game homestead against the Atlanta Hawks on Monday night, 7:30 p.m.